Or we should say, A Disciple’s Life – So Far. Here is a good news story of a Disciple member who grew up in our Region as a faithful, joyful servant of God. Every phase of her life has a strong Disciple connection. We’re talking about Kate Summers from Mt. Carmel, Illinois. Kate is the daughter of two Disciple ministers – Jim and Jackie Summers. They have served in Mt. Carmel for more than twenty years! All of Kate’s years have been in this congregation. Earlier this month, Kate attended her tenth General Assembly and she shared that she enjoyed the welcoming spirit as well as the trusted adults in leadership. From her childhood in the church, Kate has served in a variety of ways including acolyte, youth group, distributing food in Operation Share. In the local church, she has also served as a deacon and sung in the choir. Kate has been very active in school activities, too. Kate has served on the Regional Youth Council (for three and a half years) and the General Youth Council (also as Moderator) for the past year and a half. She is active in Ministry Across Generations on the General church level and appreciates the great diversity of members on that team. Kate says her life is richer because of all the people she’s met. For twelve years, Kate has been a faithful church camp participant and this summer will attend and lead multiple weeks of camp. Camp Walter Scott is her home away from home and she values the experience of everyone being accepted and understood for who they are. Kate loves being a part of the Christian Church (Disciples of Christ) because it is family. Not just her family who is regular in their participation in events like the General Assembly but everyone she has met. It is a friendly, welcoming atmosphere where people care about one another and want to know more about one another. Next month, Kate begins her freshman year at Eureka College, a Disciples of Christ affiliated school. She chose Eureka because it is similar to her hometown – small and caring, a great place to build relationships. Kate was also chosen as a Fellow in Eureka’s Disciple Leadership Program, receiving full tuition plus two on-site mentorships exploring service anywhere in the world. She’s excited about the experience Eureka can offer. Kate has many goals in life. She’d like to serve a local church, get a doctorate and write a book. She doesn’t know yet what the topic of the book will be. 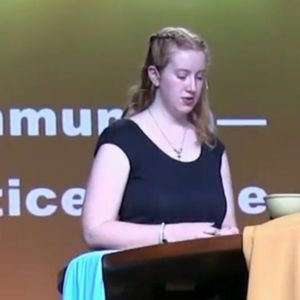 In light of the recent General Assembly and her work in the church, Kate has her sights on serving someday as General Minister and President. We think Kate embodies what it means to be a faithful member of the Christian Church (Disciples of Christ) and it is a joy to share the journey with her. What an impressive young person. I am so happy that the DOC can claim you as one of our own. I am a graduate of EC and loved my time there. Congratulations to you and to EC. I look forward to your eventual installation as GMP (15 or 20 years from now). Great job Kate. She also is a great mentor for her grade school student lunch buddy! Nancy V.